As one of the leading makers of standing desks and treadmill desks, iMovR has partnered with major health research institutions to gather the most detailed measurements to date on the metabolic health benefits of using a standing desk or treadmill desk. The findings lend even more support to the benefits of “NEAT™ Activity” – Non-Exercise Activity Thermogenesis – a term originally coined by Dr. James Levine of the Mayo Clinic. NEAT activity is that which raises an individual’s Basal Metabolic Rate (the number of calories your body burns when at complete rest) by at least 10%, but not high enough to exceed cardio exercise heart rates. One of the most common questions we get from customers has always been, "How many calories will I burn at my standing desk or treadmill desk?". Now we have a scientifically-backed research study to point to for the answers. Popular personal tracking devices, as well as cardio exercise equipment found in the gym are notoriously inaccurate when it comes to computing calorie burn. That’s because they rely on simplified algorithms that generally take only one factor into equation: cardio heart rates. To get the most accurate data on calorie burn, the data in this report was collected in a sophisticated laboratory setting using highly advanced ergospyrometry equipment (like what NASA uses to measure the exercise activity of astronauts on the International Space Station). 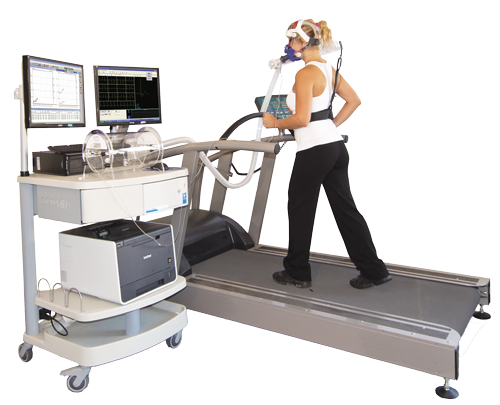 Ergospyrometry equipment provides the most accurate measurement of the metabolic “burning” of calories, protein, carbohydrates and fats, along with other data such as heart rate and lung capacity. How? Through the analysis of gases exhaled by the user during activity. Ergospyrometry equipment is used for a variety of purposes including research, rehabilitation and performance sports—and yes, it costs about thousand times more than a Fitbit! Metabolic rate represents the number of calories needed to fuel ventilation, blood circulation, and temperature regulation. Calories are also required to digest and absorb consumed food and fuel the activities of daily life. Or put another way, metabolic rate is an estimate of how many calories you would burn if you were to do nothing but rest for 24 hours. It represents the minimum amount of energy required to keep your body functioning. BMR is defined as Basal Metabolic Rate. BMR is synonymous with Basal Energy Expenditure or BEE. BMR measurements are typically taken in a darkened room upon waking after 8 hours of sleep, 12 hours of fasting to ensure that the digestive system is inactive, and with the subject resting in a reclined position. RMR can be defined as Resting Metabolic Rate. RMR is synonymous with Resting Energy Expenditure or REE. 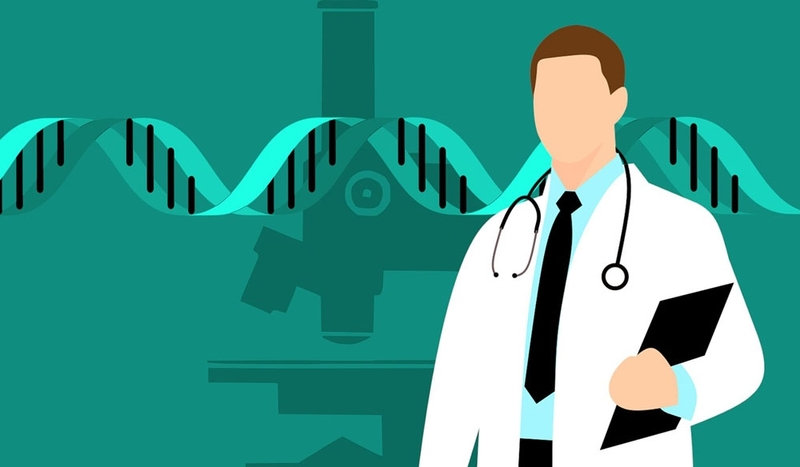 RMR measurements are typically taken under less restricted conditions than BMR and do not require that the subject spend the night sleeping in the test facility prior to testing. Other studies published on this subject have used BMR or RMR as a baseline. However, real people in the real world are not laying down at rest when at work, they are generally sitting. Because of this, the baseline measurement used in this study was the subjects’ baseline metabolic rate (their hourly calorie burn) when sitting at a desk. The study found that the average metabolic rate while sitting was 80 calories per hour (+/- 18) while the average metabolic rate while standing was 95 calories (+/- 24). Therefore, standing clearly met the definitional threshold of a 10% (or more) increase in calorie burn, classifying it as a NEAT activity. The general guidance for proper treadmill desk usage is to walk at speeds between 1.0 and 2.5 mph. This speed is conducive to higher productivity (more oxygen flow to the brain, etc.) without impacting typing proficiency (assuming an ergonomically-appropriate workstation). The graph below depicts the average incremental caloric burn from simply standing versus walking at these various speeds. 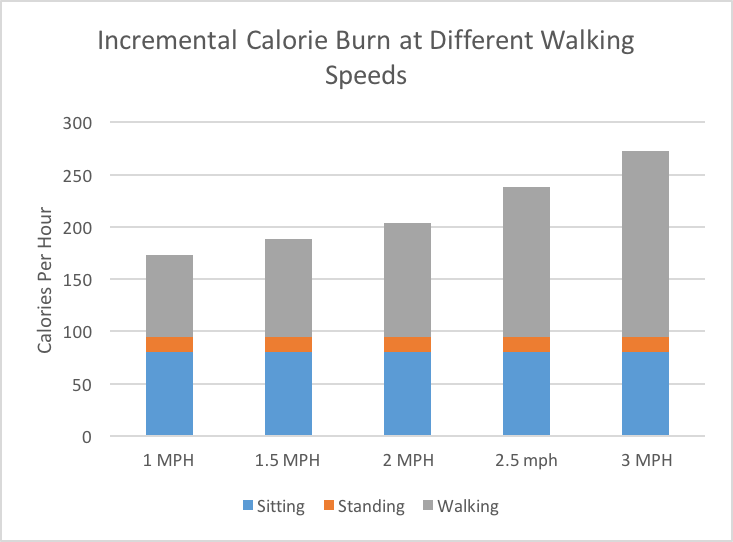 As you can see, compared to the incremental calorie burn of moving from sitting to standing (orange), walking at the minimum 1 mph speed will burn you 5x as many calories per hour, and walking at 2.5 mph will burn you nearly 10x. Average calorie burn is 170 to 240 calories per hour walking between 1.0 and 2.5 mph, with a standard deviation of +/- 50 calories per hour depending on the weight of the user. That's 2-3x as many calories as you burn sitting. Besides the speed of the treadmill, other factors affect how many calories burned at a given walking speed. The most significant factor is the individual’s body weight, as illustrated in the graph below. The study also looked at whether there were differences based on the subject’s BMI, or Body Mass Index. BMI is computed by dividing the subject’s weight by the square of their height in meters. The higher a person’s BMI, the more they tend toward obesity. 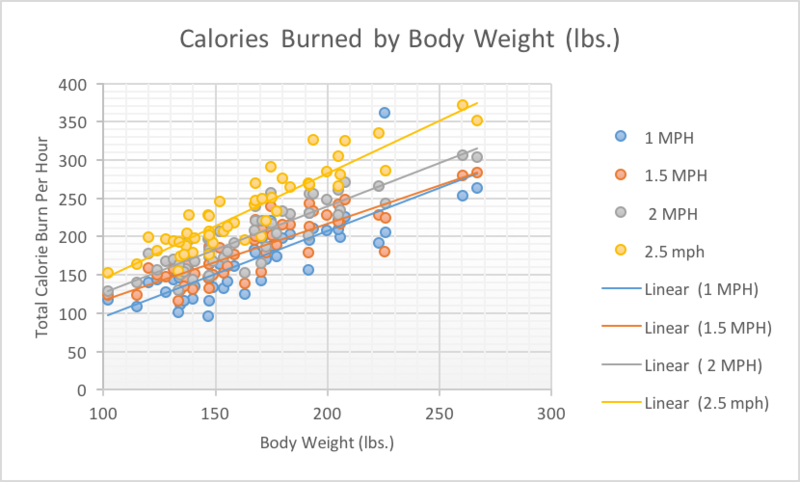 Not surprisingly, this graph looks like the results of the comparison by body weight. 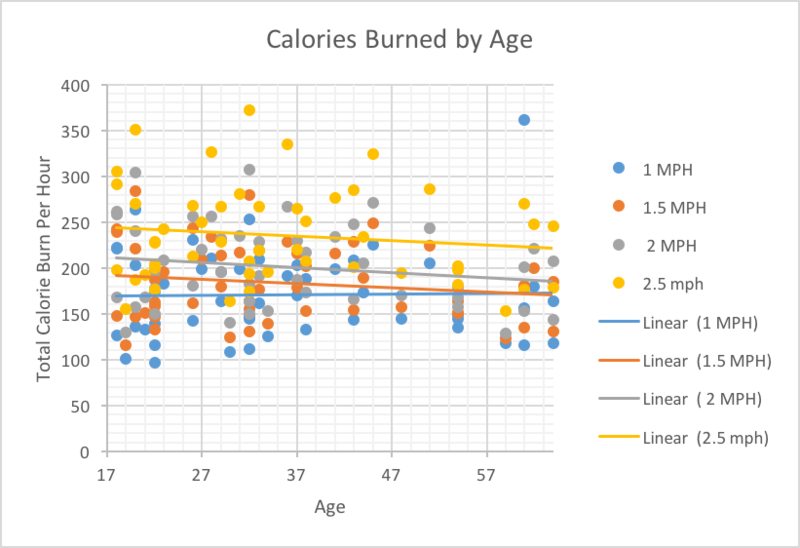 Each participant’s calories burned per hour based is plotted based on their BMI (and the speed at which they were walking). 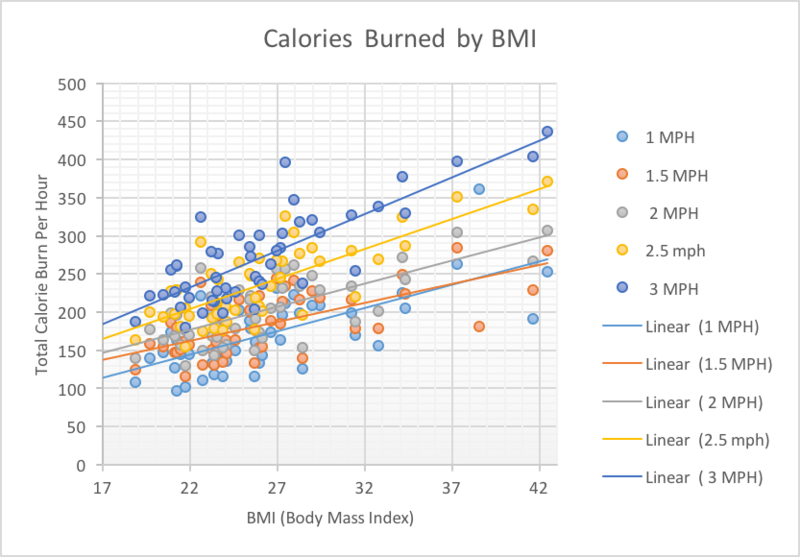 The higher the BMI, the more calories burned relative to other participants. This rule is magnified at higher walking speeds. Age is a relatively minor factor in calories burned at NEAT walking speeds, but since people gradually lose muscle mass as they get older, their overall metabolic rate lowers in turn. Spanning from college age to retirement age, participants demonstrated an average 10% reduction in total calorie burn at any given speed. Lastly, while the study looked at gender as a variable, it found only statistically insignificant differences between men and women of the same age and weight. Boost your health and calories burned with iMovR NEAT-certified products.